The many faces of Jack Skellington. 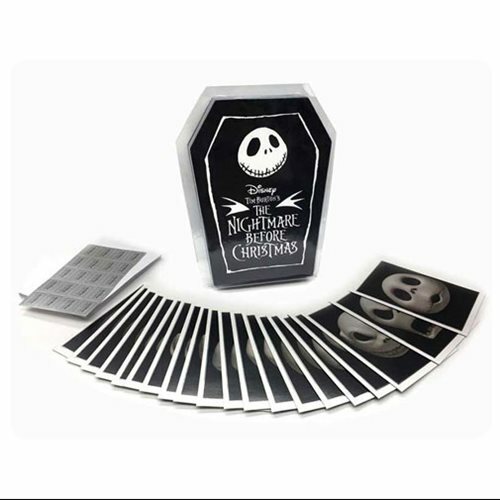 This collectible Walt Disney Archives Collection Nightmare Before Christmas Notecards Set features 20 notecards in 10 unique image designs showcasing Jack Skellington's expressive reactions, plus 20 envelopes and envelope stickers, all encased in a custom coffin-shaped box that measures approximately 9 3/4-inches tall x 7 1/2-inches wide x 1 1/2-inches deep. The back of each notecard spotlights a moment in the movie when Jack's facial expression is shown, and with two of each design, there's one card for you and one for a friend! Ages 14 and up.